A deformed bellringer must assert his independence from a vicious government minister in order to help his friend, a gypsy dancing girl. Jane Withers, who was hired to complete the role of Laverne following the death of Mary Wickes, had to match Wickes' voice and performance so that audiences wouldn't detect the difference. Withers repeated the role in the sequel, The Hunchback of Notre Dame II. Continuity: After Esmeralda unveils the new carvings, she picks up the baker and marvels at it. When she goes to set it down, she sets down the blacksmith. Then when she turns to Quasimodo the sculpture disappears. Phoebus: Speaking of trouble, we should have run into some by now. Quasimodo: What do you mean? Best Disney film ever made? Well... No. Not quite. It's not the 'conventional classic' that everyone loves and adores (see: Aladdin, The Lion King) and will show their children and their children's children. But that's just it. How anybody can deny that this is a fantastic film is beyond me. Okay, it's in no way true to the story. But who cares? This is a Disney FILM. It's hardly setting out to be a serious piece of literature-to-film. It's just... breathtaking. Not just the animation (which is some of the most accomplished from Disney to date, whilst we're on the subject), but the characterisation and pace of story. Frollo is, arguably, the most evil Disney villain ever committed to celluloid. Here, Disney touches on dark themes never before explored in their animated feature lengths; the main one being lust. The scene with 'Hellfire' is truly chilling. 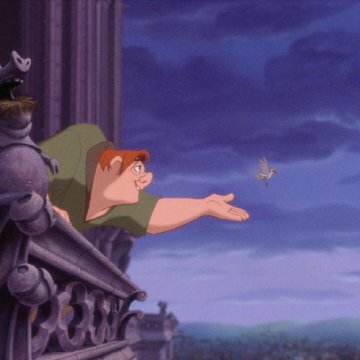 Quasimodo is a brilliant Disney hero. His alienation is easy to relate to, and yet he's still alien enough for one to feel so sorry for him. He's just so tragic. His unrequited love for Esmerelda as she runs off with someone cooler and better looking is something we can all relate to. I quite like how the ending is part conventional for Disney and part not. Yes, the pretty heroine gets the knight in shining armour, but at the same time the real leading man doesn't have to be paired off with a beautiful leading girl in order to end up happy. The voices are really talented- the notable standout for me being Kevin Kleine as Phebus, and Esmerelda is arguably one of the best things Demi Moore has ever done. I also adore, against most people's opinions, the gargoyles. Yes, they're a bit OTT, but that's what Disney sidekicks are all about, and they provide essential comedy balance for the darkness of the film. 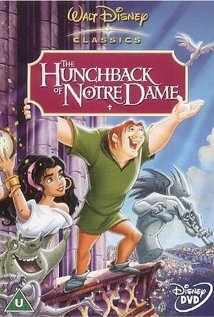 The Hunchback Of The Notre Dame may not be the most authentic film storyline-wise, but it is dark, touching, scary, poignant, funny, chilling, moving (it never fails to leave me in floods of tears) and is one of the few Disney films that can stand alone from Disney as a wonderful piece of cinematography in it's own right.